Each FullView ® camera uses several discrete cameras to provide unrivaled panoramic images and video of any scene: that is, of a scene without any constraint, such as on object distance or motion. In particular, FullView provides unrivaled, live, up-to-360°, artifact-free, blur-free, seamless video that has several times the image resolution of "seamless" video produced by competing techniques (see Comparison below). With FullView, objects can be seen far more clearly and much farther away than with other technologies, as evident from FullView's images (see Gallery). These factors are elucidated below. Each FullView design has multiple cameras effectively looking out in different directions from a single viewpoint — without parallax — with each but at most one camera looking off an individual planar mirror. Whereas several variants of the above design are possible, its implementation by FullView in 1995 was the first to provide seamless, artifact-free composite images from multiple cameras. 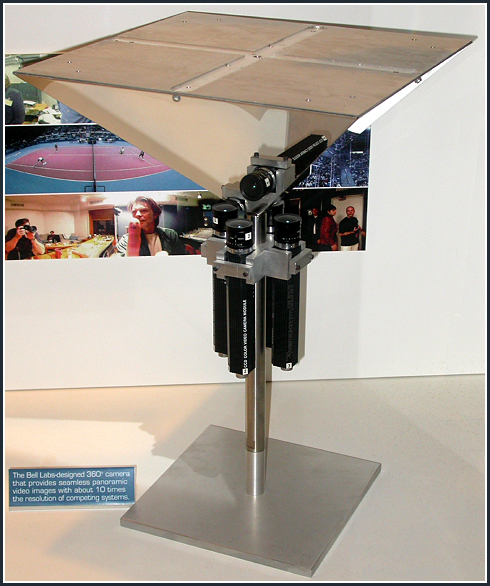 This implementation, executed at Bell Labs as illustrated above and then described in A True Omni-Directional Viewer, has been on permanent display in the lobby of Bell Labs at Murray Hill, NJ since 2000, where it was photographed below in 2009. Multiple cameras, each looking out directly in a different direction: Individual images cannot be integrated seamlessly unless objects are extremely distant, and even then only with time-consuming and complex image processing that blurs the final image. See www.ptgrey.com, www.immersivemedia.com and www.imoveinc.com. Single camera looking in different directions at different instants: Images of moving objects are distorted, fragmented or missing, all of which makes this approach suitable for imaging only still scenes. See www.panoscan.com. Single camera looking out through a fisheye or fisheye-type lens: Images of nearby objects are distorted irretrievably, the scene must be well illuminated or slow changing, and even then images can be captured only at a relatively low resolution. See www.ipix.com and www.immervision.com. Single camera looking off a nonplanar mirror: Images have low optical quality, the scene must be very brightly illuminated or static, and even then images can be captured only at a relatively low resolution. See www.remotereality.com, www.vri.ca and www.behere.com. Multiple cameras looking out directly into the scene from different positions see the world with inherently different perspectives — that is, they each see each point in space in a different direction, with the difference in directions depending on the depth of the point. This makes it impossible, in general, to combine images from such cameras into a single coherent image without "image blending" — which requires substantial image overlap, often produces image artifacts, and unavoidably blurs the composite image. Also see this primer: Outwardly Pointing Cameras. In images from a camera that is rotating to create a panorama, a moving object will in general appear different and at a different image location at every instant, precluding both the object's whole and undistorted inclusion in the composite image and its complete exclusion from that image. Designs that use a single stationary camera — such as those using a fisheye-type or panoramic lens or a nonplanar mirror — provide low resolution not only because they use a single image sensor unlike multi-camera designs, but also because their circular or ring-shaped optical image typically spans only about half the area of a standard 4:3 rectangular sensor. However, see ImmerVision. Reflection off a nonplanar mirror, in general, is blurred because each perceived image point is actually the image of an extended region in space — the size and shape of this region depending not only on the shape of the mirror, but also on the size of the camera aperture and on its position relative to the mirror. Reflection off a planar mirror is always clear and sharp, irrespective of the size of the camera aperture and its position relative to the mirror. FullView has numerous patents worldwide that it strives to enforce vigorously. Patent No. 6,700,711, Priority Nov 30, 1995, Issued Mar 2, 2004. Patent No. 6,356,397, Priority Nov 30, 1995, Issued Mar 12, 2002. Patent No. 6,285,365, Filed Aug 28, 1998, Issued Sep 4, 2001. Patent No. 6,219,090, Priority Nov 30, 1995, Issued Apr 17, 2001. Patent No. 6,195,204, Filed Aug 28, 1998, Issued Feb 27, 2001. Patent No. 6,144,501, Filed Aug 28, 1998, Issued Nov 7, 2000. Patent No. 6,141,145, Filed Aug 28, 1998, Issued Oct 31, 2000. Patent No. 6,128,143, Filed Aug 28, 1998, Issued Oct 3, 2000. Patent No. 6,115,176, Filed Nov 30, 1995, Issued Sep 5, 2000. Patent No. 6,111,702, Priority Nov 30, 1995, Issued Aug 29, 2000. Patent No. 5,990,934, Filed Apr 28, 1995, Issued Nov 23, 1999. Patent No. 5,793,527, Filed Jun 30, 1995, Issued Aug 11, 1998. Patent No. 5,745,305, Filed Apr 28, 1995, Issued Apr 28, 1998. Patent No. 5,539,483, Filed Jun 30, 1995, Issued Jul 23, 1996. Whereas a single camera is hindered by its low resolution, multiple cameras looking out directly cannot in general provide seamless, artifact-free images, as illustrated below and explained at length in Outwardly Pointing Cameras. Below is a good-faith comparison of the various 360° cameras in use today. Do visit the websites of the various companies to learn more about their products and to see their image quality first hand. Included below are still cameras, which capture still images, but excluded are still-scene cameras, which capture images of still scenes, such as cameras that rotate to create panoramas. If you are a camera user or manufacturer and believe our description of your technology to be inaccurate, misleading or absent, please do let us know and we will correct any error.